Efficient cabin windows are important in lowering the overall cabin energy consumption. 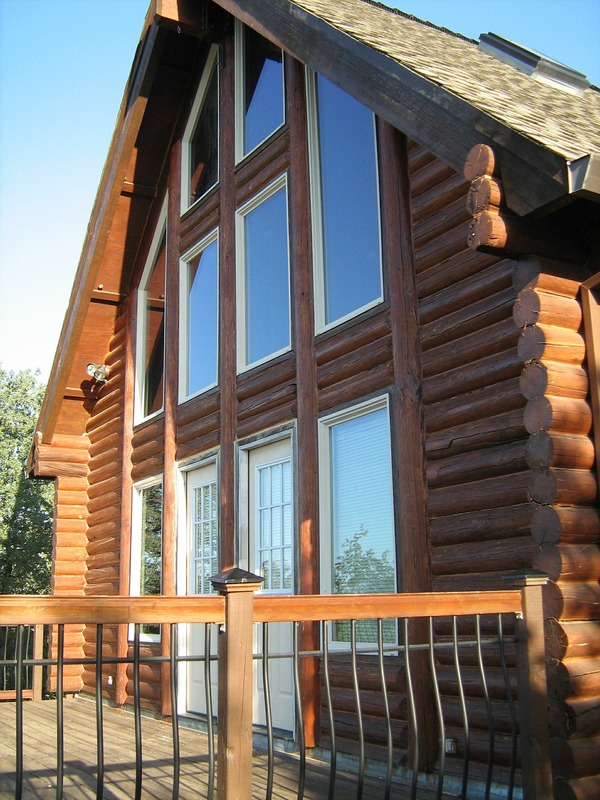 Window efficiency is easy to calculate and is a key to maintaining an efficient, high-performance log home. The ability to quickly and accurately determine the energy efficiency of any given window is a crucial skill that will pay you back many times over. You can use REScheck to determine your energy code compliance. The best way to choose efficient cabin windows is by looking for the National Fenestration Rating Council (NFRC) label on the window and using it as a guide. The NFRC is a non-profit collaboration that provides unbiased comparisons between different window brands and types. This makes it very easy to compare the energy efficiency of several windows. The U-factor measures the rate of heat flow through a window. It can be thought of as the opposite of an R-value, a number many people may be more familiar with. R-value is the measure of resistance to heat flow and is the reciprocal or inverse of the U-factor (R = 1/U). Using the U-factor you can compare the insulating properties of windows, but pay attention to whether the U-factor applies to the entire window or just the glass. The glass alone will have a lower U-factor while the overall window can use the frame and spacers to increase insulation. The smaller the U-factor, the less heat is transmitted. For best energy conservation and lowest window energy loss the total window U-factor should be 0.5 or lower and preferably below 0.4. 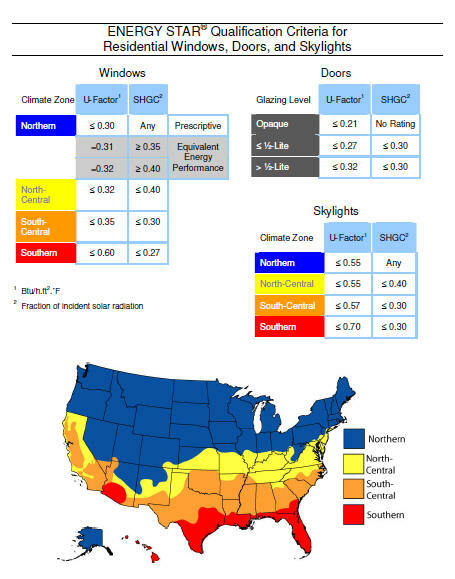 The Solar Heat Gain Coefficient is specifically a measure of the rate of solar heat flow through the window. It is expressed as a number between 0 and 1. A window with a lower Solar Heat Gain Coefficient transmits less solar heat. Using the SHGC will give you an idea of how much heat the window will allow to pass from the sun’s energy alone. In a cold, northern climate you may want heat to flow into the house from the sun, while down south you want to block this additional heat gain inside your log home. Carefully considering your use of solar power can provide great energy savings. For greater efficiency, some windows reduce solar heat gains by using what are called “spectrally selective glazings”, these are special tints or modified low-E coatings. The Visible Light Transmittance value is a measure of the fraction of visible light that passes through the window. The higher the transmittance, the more light will pass and the brighter it will be inside. Some of the treatments and coatings used on the glass to make efficient cabin windows can reduce visible light and make things dark so you want to ensure that you choose cabin windows with a high visible light transmittance -- that is, glass transmittance greater than 0.6. The Air Leakage rating measures the rate of air infiltration through the window. This is another key factor because even the best insulated window can lose heat if air can get past the glass. You will also want to be very careful about proper window installation to keep air infiltration and window energy loss to a minimum. In addition to these important factors, there are a couple of newer technologies that help create efficient cabin windows. Low-emittance (or low-E) coatings reflect heat back outside during summer and reflect heat back inside the cabin during cold weather. These low-E coatings reduce the UV or ultraviolet light that passes inside your cabin and can reduce sun damage and fading on interior fabrics and materials, something to consider for your cabin interior design. Some window manufacturers fill the space between multiple panes of glass with special gas that reduces heat flow and adds insulating capacity. For a complete understanding of solar control, ventilation and air flow recommendations, condensation, U-factors, window energy rating and labeling, a window checklist and a window energy glossary, read “Selecting Windows for Energy Efficiency”, put out by the US Department of Energy. Right-click here to download this PDF file. You will need Adobe Reader (the latest version is recommended) installed on your computer in order to open and read this file. You can download Adobe Reader here (a new window will open so you can download it without leaving this page). If you want to open the file in your browser window, just click on the link (not all browsers have this feature). If you prefer instead to download the file to view later, then right-click on the link and choose "Save Target As" or "Save File As." Then select where you want to save the file on your hard drive. Once you have saved the file, locate where you saved it, and double click to open it. In order to print, open the downloaded file, and select the "Print" option from the menu. Efficient cabin windows are easily chosen by using the National Fenestration Rating Council (NFRC) labels as a guide when comparing windows. Specifically, the four factors of U-Factor, Solar Heat Gain Coefficient, Visible Light Transmittance and Air Leakage provide the important information for your selection.